VANCOUVER, May 16, 2018 /CNW/ - Filo Mining Corp (TSX-V, Nasdaq First North: FIL) ("Filo Mining", "Filo", or the "Company") is pleased to announce continued excellent results from the recently completed 2017/18 drill program at the Filo del Sol project in San Juan Province, Argentina and Region III, Chile. A total of 9,411 metres was drilled during the program, which was completed at the end of March, 2018. In total, 31 reverse circulation (RC) holes and 9 diamond drill (DD) holes were completed during the program. Assay results for 11 RC holes are presented here, and results from the remaining 9 DD holes will be released once the final assays have been received. Commenting on today's results, Adam Lundin, CEO of Filo Mining stated, "The drill results from our 2017/18 field program continue to impress. The results released today, along with those we released on April 27 of this year, not only suggest that there is strong support to convert part of the inferred oxide mineral resource to the indicated category, they also support that testing for resource extension beyond the 2017 mineral resource limit at the Filo Del Sol Project is warranted. The results of the 2017/18 drilling will be incorporated into an updated mineral resource estimate to support the Pre-Feasibility Study ("PFS") which is currently underway." Filo del Sol is a large high-sulphidation epithermal copper-gold-silver deposit. The upper portion of the deposit is oxidized and includes from top to bottom, a gold oxide zone, a copper-gold oxide zone and a silver-rich zone. The oxide portion of the deposit is underlain by copper-gold sulphide mineralization. The drill holes reported here tested all of the oxide zones. The northern section of the deposit which contains ~90% of the current resource is referred to as the Filo Zone; the southern section is referred to as the Tamberias Zone. One of the main goals of the 2017/18 drill program was to convert a part of the inferred oxide mineral resource to the indicated category and most of the holes in this release were drilled for that purpose. The results suggest that we are well on our way to achieving this objective. The mineral resource remains open laterally and to depth, and several other holes were drilled adjacent to the inferred mineral resource in order to test for resource extensions. The holes in this release span a distance of 2.2 kilometres from VRC165 in the south to VRC164 in the north. Nine of the holes announced today were drilled into the Filo zone of the deposit and are expected to either convert existing inferred material to indicated or add to the mineral resource. 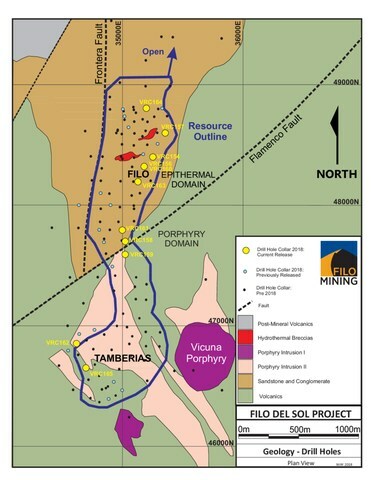 The Filo gold oxide zone was intersected by the upper part of VRC164 (20m @ 0.95 g/t gold) in an area classified as inferred mineral resource. All of the Filo holes intersected the copper-gold oxide zone, in areas that are either within the inferred mineral resource or adjacent to it, with grades that are generally consistent with those predicted by the mineral resource block model. Three of the holes intersected the silver zone, including a broad zone of near-surface mineralization starting at 12 metres down the hole in VRC161 (80m @ 101.7 g/t silver). These silver zone intersections are all within the inferred mineral resource. Two of the holes presented here were drilled into the Tamberias zone. VRC162 extends the gold oxide zone approximately 20 metres beyond the 2017 mineral resource limit and VRC165 intersected the copper-gold oxide zone in an area of inferred mineral resource. The results of the 2017/18 drilling will be incorporated into an updated mineral resource estimate to support the Pre-Feasibility Study ("PFS") which is currently underway. The PFS follows the completion of a Preliminary Economic Assessment ("PEA") of the project, the results of which were released by the Company on November 28, 2017. The PEA incorporated open-pit mining and heap leach processing of only the oxide portions of the deposit. The results of the PEA demonstrate a robust project with strong economics, highlighted by an estimated after-tax NPV of US$ 705 million using a discount rate of 8% and an IRR of 23%, with an average estimated annual life of mine production of approximately 50,000 tonnes of copper, 115,000 ounces of gold, and over 5 million ounces of silver. This information is information that Filo Mining Corp. is obliged to make public pursuant to the EU Market Abuse Regulation. This information was submitted for publication, through the agency of the contact person set out below, on May 16, 2018 at 2:30 p.m. Pacific Standard Time.